UltraSmart is a brand promoting healthy lifestyle, gathering pieces of information for better knowledge and offering range of products for maintaining vitality in everyday life. UltraSmart is for people interested to know more about prevention and minimization of possible risks related to various health problems. Acting smart is key to better life, UltraSmart is great partner in this process. ELEPHANT Co. is Serbian company, was founded on August 8, 1988 and is today among the leading companies in the field of pharmaceutical manufacturing services. ELEPHANT Co. has systematically upgraded its business by introducing these standards: ISO 9001:2008, ISO 14001:2004 ,HACCP, BS OHSAS 18001:2007. STRONG NATURE brand was established in 2002 with goals of production top quality dietary supplements, adapted to the life standard of the country and the region where we are living in. Today, STRONG NATURE is among the leaders on the domestic market in category of dietary supplement with over the 60 products portfolio in various pharmaceutical forms. Kirkman® has been producing pharmaceuticals and specialty nutritional supplements since 1949. Kirkman is the oldest and one of the leading manufacturers of nutritional supplements for individuals with food allergies, special dietary requirements and environmental sensitivities. Kirkman®'s goal is to offer the purest, most up to date, highest quality dietary supplements available and in the dosage forms which will be easy to administer to children, adults, and people with special needs and special requirements. Kirkman® also formulates versions of its products which will be appropriate for the sensitive individual or for those with allergic tendencies. These versions of our products are what constitute our very popular “Hypoallergenic” product line. SHMIDT Ltd. is a Bulgarian company with 20 years experience distribution of medical products, food supplements and dietetic and diabetic foods. Bionic Solutions Management GmbH is German company, which develop unique medical devices. Herpotherm is a chemical-free way to treat cold sores. This easy-to-use device prevents and relieves cold sore outbreaks. 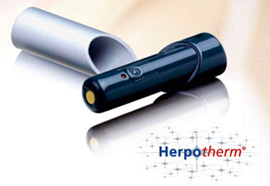 Herpotherm is a multiple-use device, 100% clinically and dermatologist tested and lasts for years. Bite away is a device, which was developed for the external treatment of insect bites and stings as gnats, mosquitos, wasps, hornets and horseflies. It can be used straight away and at any time due to its small and handy shape. Walmark is a Czech company that has been producing natural vitamins, herb extracts products and pharmaceuticals since 1992. Walmark has made rapid progress over a short time and is currently offering one of the broadest ranges of products to a large and diverse body of European consumers. Walmark health products are available in pharmacies throughout Estonia. OÜ Remedex represented Walmark for 14 years.